Mike Peters will perform at a very special ‘Man In The Camo Jacket’ DVD launch party concert at Pizza Express Live in Holborn, London on Friday 10th November 2017. Performing two very special and rare acoustic concerts (one beginning at midday and a second later in the evening at 6:30), Mike Peters will present a sneak preview UK screening of ‘Man In The Camo Jacket‘ along with an intimate Q&A, followed by a full set of acoustic Alarm songs. The film is being presented by Kaleidoscope Pictures (USA), and the event promoted by Pizza Express Live as part of their special guest launch season featuring Morcheeba, Martin Kemp from Spandau Ballet, Tom Chaplin from Keane, Mica Paris, Steve Harley and Glenn Tilbrook from Squeeze. Man in the Camo Jacket is a feature-length documentary film that has won many awards on the US film festival circuit including The Humanitarian Award at the American Documentary Film Festival in Palm Springs and Best Music Film at the Newport Beach Film Festival in California along with exciting reviews in both the Los Angeles Times and Billboard Magazine. 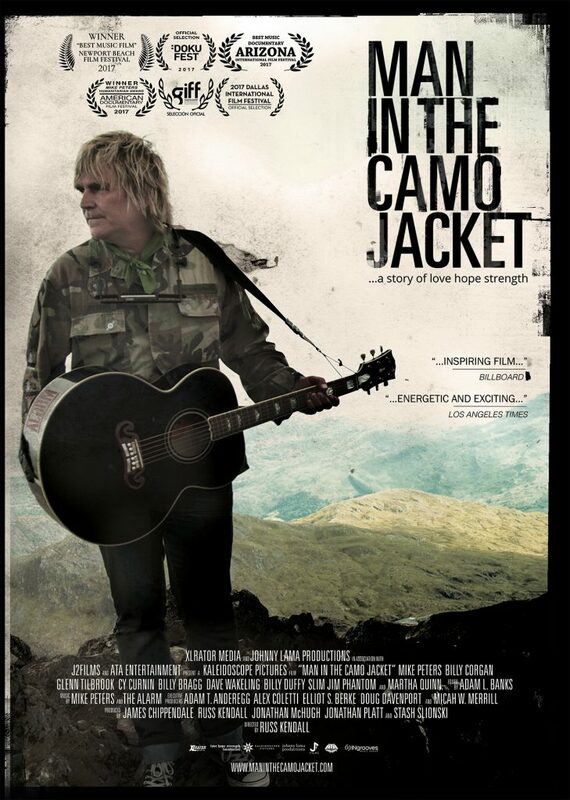 Man in the Camo Jacket which is being unveiled in the UK for the first time in cinematic format, tells the story of iconic Welsh rock musician Mike Peters, his rise to fame, battle with cancer, and inspiring climb back as he enlists some of the world’s top musicians to help save the lives of cancer patients around the globe. Full details of the Man In The Camo Jacket DVD release will be announced shortly but UK fans who attend the event in London on November 10th will be guaranteed to see it before anyone else and in the company of Mike Peters himself. Tickets for both the midday and evening performance are on sale now.